Richard and Judy offer a high level of personal service with superb cleanliness, receiving 100% in the Visit England Inspectors report!, relaxed hospitality, delightful rooms and delicious food and we have received the coveted, prestigious Visit England National Breakfast Award and the AA Breakfast Award too! Amble House is an AA 4* Gold Star Award and Visit Britain 4* Silver Award Guest House, quietly situated but close to the town centre, lake and surrounding fells. We have 5 bedrooms of varying sizes with fully tiled, fully appointed shower en-suites ; in 2010 we installed filtered water drinking taps. Each bedroom is decorated and maintained to an excellent standard with comfortable beds, flat screen t.v's, hairdryers, radio alarm clocks and well stocked hospitality trays with biscuits and a good selection of teas, instant and fresh coffees including Fairtrade products. We know we are not the biggest but we like to think we are among the best! Commission Free Bookings via Keswick.org mean no hidden charges passed on to you! It you choose to book online please wait for us to reply to you! 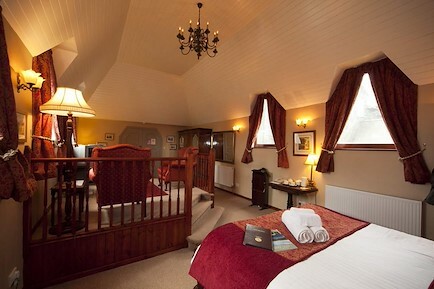 Single supplement offered in double rooms only - exc.BH/Festivals - price quoted on request. M6 junct.40 A66 to Keswick, 1st left signposted Keswick to T-junct, right onto A591 towards town centre; 5th turning on left is Greta Street leading on to Eskin Street. Your enquiry will be sent directly to Amble House. Please fill in as much detail as you can.